Very high quality fried garlic from Aroy-D. Fresh and fragrant. Large container will go a long way. 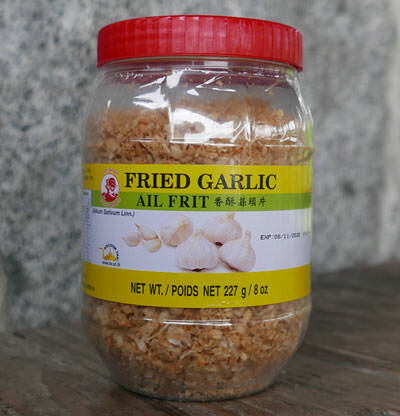 Sprinkle these fried garlic bits on top of all Asian soups and noodles. Thai garlic is especially aromatic, and adds fragrance as well as flavor. Fragrance is a critical element of Thai cooking, and this product is a delightful addition to not only a wide variety of Thai recipes but also European and American recipes. See below a list of recipes at ImportFood.com that use fried garlic. Ingredients: garlic 88%, palm oil 12%. We also offer fried red onion (shallot) and ground Thai garlic. Thai Rice Soup With Shrimp, "Khao Tom Koong"